Gloucester resident Mary Ann McCormick and her daughter Nicole Nordensved enabled us to enjoy quite a dispute over taste recently. In 2007, McCormick started Lark Fine Foods, a purveyor of fabulous “grown up” cookies, and they have been growing in popularity ever since. These are sweet and savory wonders chock full of real butter and quality ingredients, made without preservatives or genetically modified ingredients. On a recent stop at Shubie’s in Marblehead, I met Nicole, a Salem resident who works for her mom a couple days a week and was handing out samples. I was immediately fascinated with some of the taste combinations. Chocolate and chili? Shortbread with rosemary and sea salt? And what the heck were olive wafers? These are definitely not your kid’s cookies. I brought a bunch of flavors back home and invited Jill to share them for a taste test. The next day, I received an e-mail from her outlining her response. Her favorites were the Polenta Pennies, bite-sized lemony cookies that feature golden raisins. She had also enjoyed the Coco Locos, toasted coconut butter cookies, but felt some of the others were too strong. Her assessment made me laugh out loud, because it was the exact opposite of mine. While the sweeter cookies were good, I found the spicy ones much more memorable. 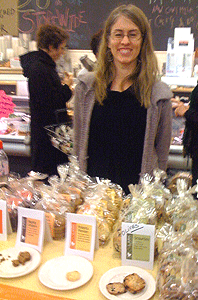 The rich chocolate Cha-Chas with their hot spicy kick and the tangy Mighty Gingers were both terrific. 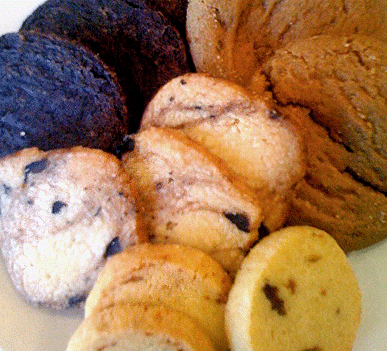 Lark also features two cookies with sweet and savory combinations; the Scourtins, a traditional French-style wafer made with olives is the most unusual in their repertoire, and the Salted Rosemary Shortbread, which was my absolute favorite of all the cookies. The organic rosemary and the sea salt make the buttery shortbread sing with subtle flavor. Lark’s products, which are headquartered in Gloucester and baked in Essex, can be found in specialty food stores and markets throughout New England, helpfully listed on their Web site. You can order online as well. Whether you go for spicy or mild, if you try these unconventional treats yourself, let us know your favorites in the comments—and remember that disputes over taste can be seriously fun. Another great discovery! The Salted Rosemary Shortbread are tempting me from afar.